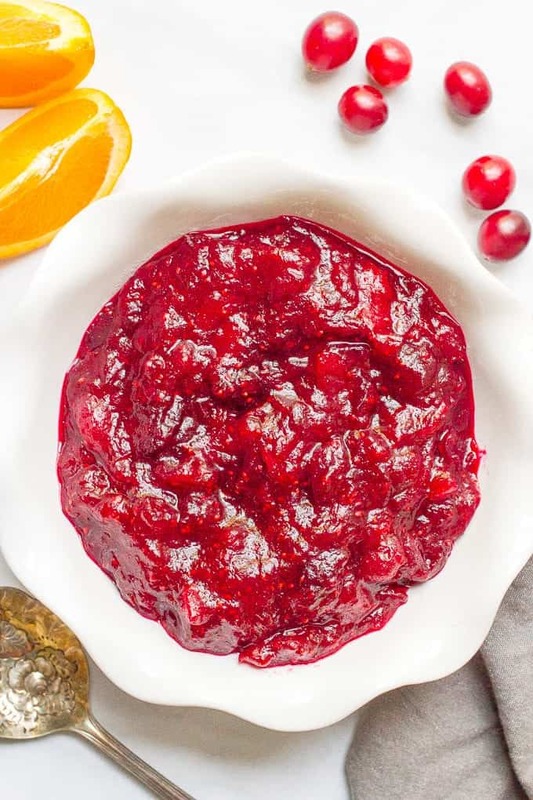 This homemade easy cranberry sauce requires just 15 minutes and 4 ingredients, including orange zest and honey to give it a great depth of flavor! Happy Friday friends! I hope you’ve had a good week and recovered from any sugar highs and candy crazes that Halloween brought. We’re kind-of low-key about the anniversary thing. We give each other cards and maybe make a nice dinner or go out if we’ve got a babysitter. But we just went out last weekend for my birthday, so we stayed in and I pulled out our wedding album so we could look at how young we used to be. 😂 Maybe next year for the big TEN we’ll do something big to celebrate. Now on to the FOOD! Cranberry sauce was never a big thing for me at Thanksgiving. I didn’t get the hype about it. Actually, I was a kid, so I probably didn’t know there was hype about it. And for all of you who feel the same way, please trust me and give this recipe a try. 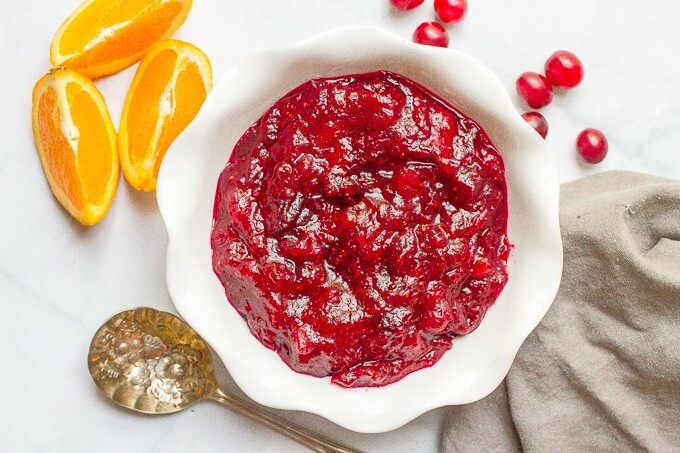 My homemade easy cranberry sauce is the perfect amount of sweetness — without making you feel like you just ate a bowl of pure sugar — and has such a great richness and robustness from the orange zest and the honey. It’s also all about being super duper easy and very fast. Just 15 minutes and 4 ingredients. Which means you’ll be able to make it ALL the time, like I’ve been doing already this fall. Basically, I went from being a non-cranberry sauce lover to being a little bit obsessed. 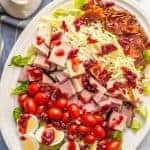 I use this sauce in my leftover Thanksgiving turkey cranberry cream cheese sandwich (aka sandwich heaven!) and in my cranberry balsamic pork chops. And trust me, there will be more cranberry sauce recipes to come! You can substitute fresh orange juice for the water if you want more orange flavor in your cranberry sauce. You can add the honey to taste, to get it to your desired level of sweetness. I like mine mid-level sweet, I’d say, and I use a heaping tablespoon. It depends on the tartness of the cranberries though. I prefer my cranberry sauce a little chunky like this, but you can blend the mixture if you want a smoother cranberry sauce. You have to sorta test and see about the amount of liquid after yours is all mixed. It can vary a lot. I often add the juice of the orange that I zested at the end if it seems thick. Keep in mind, too, that the sauce will thicken as it cools and will also thicken over time. 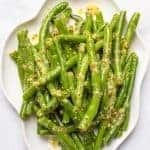 If you are making this in advance, I highly recommend you add extra liquid (1/4 cup or so). This cranberry sauce will keep in the fridge for at least a week. You can also freeze extra for later. Enjoy friends and have a great weekend! Check out my new VIDEO for this recipe to show you how seriously easy it is! 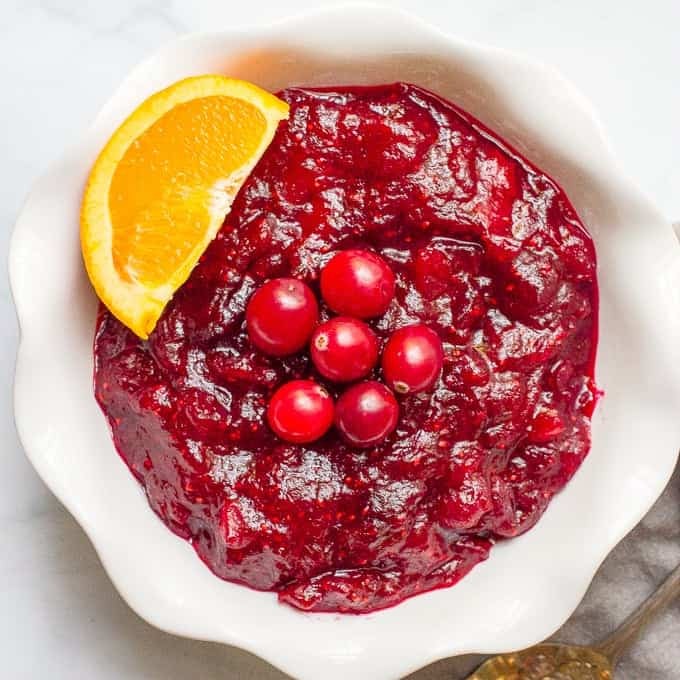 Homemade easy cranberry sauce requires just 15 minutes and 4 ingredients, including orange zest and honey to give it a great depth of flavor! 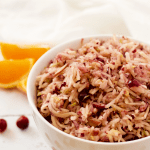 Combine cranberries, sugar, orange zest and water in a medium sauce pan over medium heat. Bring to a boil then reduce heat to medium low and simmer for about 10 minutes, until cranberries have popped and the mixture has started to thicken. Taste and add honey to desired sweetness. You can also add additional sugar, if desired, depending on the tartness of your cranberries. Check the consistency and add extra liquid (water or the juice of the orange), as needed. See notes. Let cool and serve at room temperature, or cover and refrigerate for later. 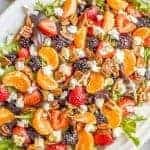 You can substitute fresh orange juice for the water if you want more orange flavor in your cranberry sauce. Or add some extra at the end if you want to thin out the sauce. The sauce will thicken as it cools and also thickens over time. 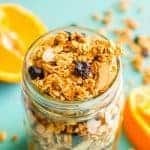 I recommend you add extra liquid - water or orange juice, up to 1/4 cup - if you are making this in advance. 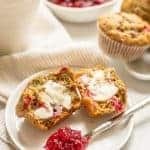 If I have a particularly tart batch of cranberries, I sometimes sprinkle a little sugar into the sauce when I'm tasting it at the end to sweeten it up. I prefer my cranberry sauce a little chunky like this, but you can blend the mixture if you want a smooth cranberry sauce. Me too 😉 Thanks so much Brynn! 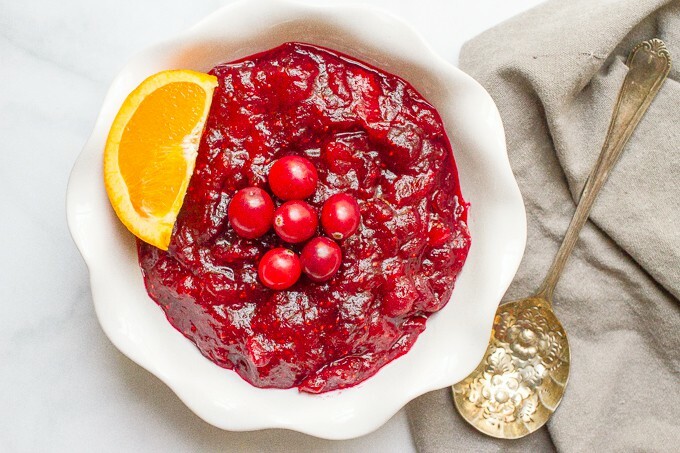 Who knew you could make cranberry sauce even better! I love that you added the orange. Thanks Sonali! It gives it such great flavor! This cranberry sauce looks great! You got me dreaming about Thanksgiving! !